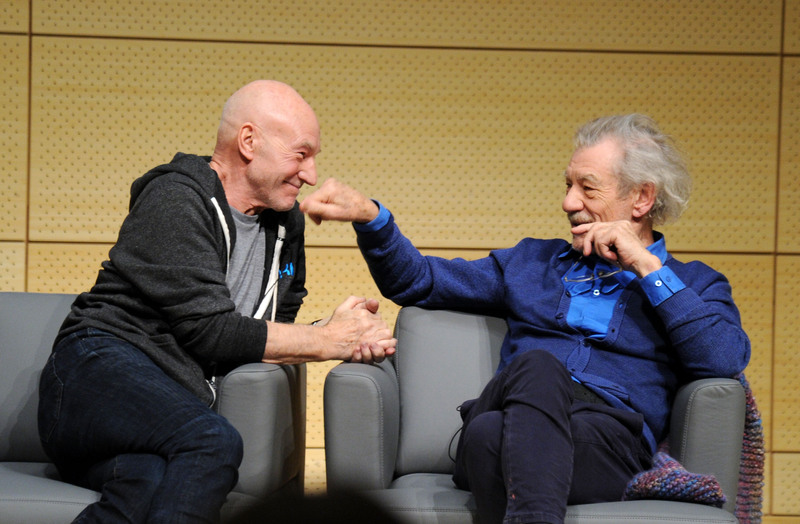 Have you ever seen anything as beautiful as the friendship between Sir Ian McKellen and Sir Patrick Stewart? There's only one correct answer here, and that answer is: "No, of course not, their unadulterated love for one another is the purest thing on this entire godforsaken planet." The two British knights have showcased their adorable bromance many times throughout the years, whether through appearing onscreen together in the X-Men franchise, appearing onstage together in Waiting For Godot on Broadway, taking hand-holding pictures while touring New York City, officiating each other's weddings, going to Super Bowl viewing parties, or playing the Newlywed Game — and winning. Now McKellen & Stewart have kissed on the red carpet, and it's probably their most beautiful moment yet. ...by the mere fact that these two human beings are once more occupying the same physical space. ...by the sheer flawlessness of their bromance. ...due to the knowledge that you'll never have a love as true as theirs. ...by the fact that no one has made a buddy comedy starring these two besties yet. ...this time by a desire to get in on the adorable lovefest. ...of the fact that they so generously allowed you to witness their perfection. ...due to the combination of all the above emotions happening at the exact same time.